Pool decks weather and wear out in our South Florida climate. You don't notice it because you're seeing it over time. One doesn't really notice how bad it's getting until it's really bad. But don’t worry, we have expert crews and high tech materials that will restore your pool deck. Your pool and patio area can look like new again. If you want to make your pool or patio deck look like new again or if you are simply tired of the boring, faded look of your concrete deck, then consider resurfacing it! Resurfacing can be sprayed on or hand troweled to most existing surfaces. They can be used to add texture, a new pattern, color and slip resistance. 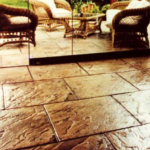 Some resurfacing systems allow our expert crews to stamp or stencil an existing surface so you can get an entirely new imprinted look of stone or other materials without the costly need of removing and replacing the concrete. All you will see is the beautiful newly resurfaced pool deck. Wouldn’t you like your concrete deck to look so good? If your pool deck has paint on it now, newly applied materials may not stick. 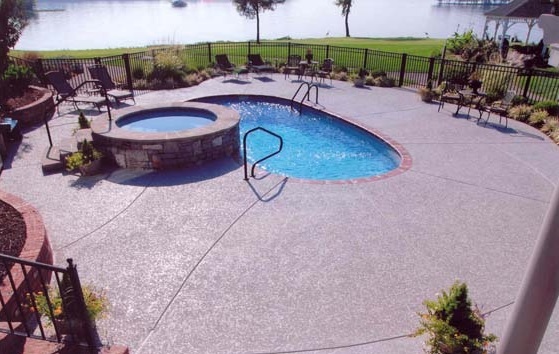 Sand blasting painted surfaces is a good idea prior to trying to resort a painted pool deck. Today’s overlay products are a blend of polymer resins with cement, sand and other additives. These formulations improve performance, slip resistance, aesthetics. They also bond better to existing concrete than older products. The new systems resist damage from salt, pool chemicals, UV exposure, freeze-thaw conditions and abrasion much better than they did in the past. Some of these formulations dry faster, allowing us to transform your worn-out, lackluster pool deck into decorative “work of art” in as little as a day. Lets make plans to restore that pool deck! 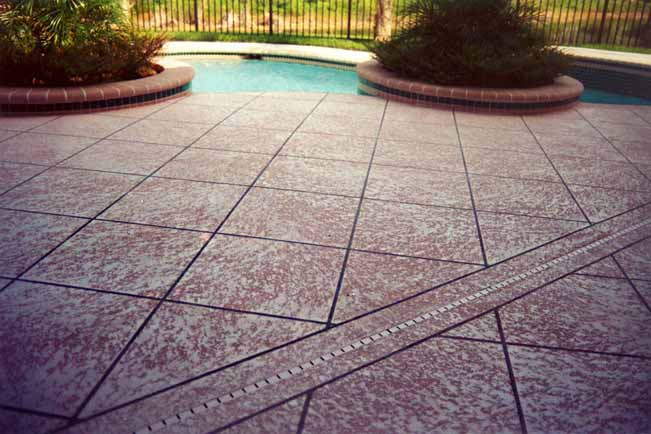 When home owners decide to resurface a concrete pool deck, they instantly bring a new and enhanced sense of attractiveness to their backyard. The good news is that the cost for resurfacing is much less than the cost for replacing old concrete pool decks with new concrete. But don’t hire a handyman to try and resurface your pool deck. Always hire a licensed and insured contractor for swimming pool resurfacing. Let our professional installers show you what they do best, resurface your pool deck and patio area. When it comes to Pool Deck Resurfacing services and projects in the state, we are the leading and most experienced company. With professional hands and a world class team of expert technicians, we make your ugly pool deck become like brand new and looking much better. Our services include providing pool deck finishes, pool deck renovation, pool patio resurfacing, and pool deck concrete resurfacing amongst others. Pool deck resurfacing is essential for homeowners when the need for a pool deck that has a solid, stone exterior and which won’t be slippery when wet or develop crack after a short period - is in view. With various ways to resurfacing a pool deck, some methods are proven to lack durability, and involve messy wear & tear outs. Some others are so expensive that they end up costing homeowners much as they go spending more than necessary budget. As a reliable and reputable pool deck concrete resurfacing company, we make sure clients get the ideal pool deck resurfacing job executed, one that’s very durable and aesthetically produced! With our services, your pool and patio area can look and feel like new again. And with various cutting edge methodologies applied by us and with state of the art equipment - your faded concrete deck can be resurfaced through spraying or being hand troweled. Such process is designed to help add better texture, new patterns and colors, and slip resistance benefits to your pool or patio area. Slippery surfaces lead to accidents BUT with us – that will never be an issue to worry about. All you will see is the beautiful newly resurfaced pool deck. You can brighten up your old pool deck today by contacting us to help restore it. Our pool deck restoration service will help add color & shading or create the perfect look of natural stone. This will help reignite your family’s interest in using the pool often and having delightful BBQ’s on recurrent basis! With expert installers in our employ, you can only expect a pool deck resurfacing job that will amaze you. As we operate with the best of industry equipment – you get more detailed pool deck finishing, one that is custom-fitted to your specifications. Current day overlay products are a combination of polymer resins with cement, sand and other additives. These formulations increase performance, slip resistance, general aesthetic values and also dry faster, allowing us to transform your worn-out, lackluster pool deck into decorative “work of art” in as little as a day. Let’s make plans to restore that pool deck for you today as you give us a call now for a free estimate on 561-586-5655 or fill out the form below for more information.